It can be 100 degrees outside, and you will catch me wearing my cozy fleece socks trying to keep my feet warm. Over the summer when everyone is blasting their AC, I’m trying to decide whether or not it’s appropriate to turn the heat on to melt the icicles from my ears and nose. Yes, I am one of those people who are always cold. 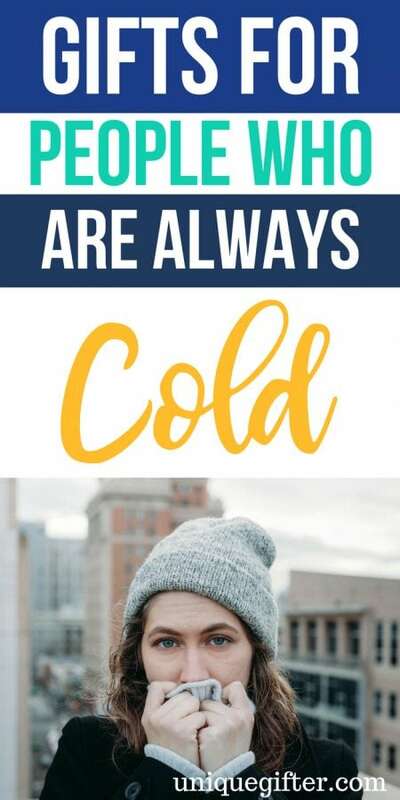 If you are gift-shopping for someone who is always bundling up to stay warm despite the air temperature, you may want to consider one of these Gifts for People Who Are Always Cold. Help a loved one stay extra warm at night with this Heated Warming Comforter. A scarf is great to help you stay warm, but a Heated Scarf is even better! I know what you’re thinking, “Of course, a jacket for someone who is always cold.” However, this Heated Jacket is a bit of luxury that the recipient will certainly not be expecting. For those who can just never seem to get their feet warm, these Rechargeable Insoles are definitely something to consider. These Electric Slippers are sure to be the coziest shoes the recipient has worn yet. What’s better than your average pair of socks when you’re feeling a bit chilly? These Electric Heated Socks. Electric Blankets are popular gifts for those who are chronically cold or just trying to survive the winter. For those who just need an extra layer to keep warm, this Heated Vest would be quite beneficial. Help a friend keep their hands warm while still able to work and utilize their electronics by gifting these Touchscreen Warming Gloves. Gift a bit of comfort with this Energy-efficient Ergonomic Foot Warmer. Hoodies are perfect for those who are always cold. Take it up a notch with a Heated Hoodie. A good way to warm yourself up is with a hot soup or drink. For this reason, a Thermos is a handy tool to have on hand for those who have trouble warming up. This Neck Warmer can provide an extra bit of warmth that’ll melt those icicles with a quickness. Warming your ears just got easier thanks to these Bandless Ear Warmers. Sometimes, all we need is an extra layer to achieve that warmth we seek. Help a friend or family member do just that with a comfy pair of Long Johns. These Hand & Toe Warmers are perfect for when you are on the go. This Portable Heater is great for the office, or even at home, when you need that blast of heat to melt the ice from your hands and feet. There’s nothing like cuddling up with a cozy Pillow Warmer when that chill is getting the best of you. We all know sweaters are great for when you are chilly, but it is also great to have pockets to stick your hands in when they get a little cold. Hot Cocoa is the perfect treat to keep you toasty. It also makes for a really great gift. Sure we may look kind of crazy wearing our winter gear at the pool, or switching on our personal heater while everyone else is fighting to be in front of the fan. But we deserve to be comfortable too. With one of these cozy gifts, you can help your “chronically-frozen” friend or family-member stay nice and toasty.